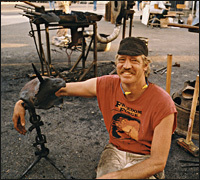 KIRK McNEILL is the artist-blacksmith of Freedom Forge, specializing in custom architectural metalwork. He has been smithing for ten years, and is a board member of the California Blacksmith Association, and a member of ABANA (Artist-Blacksmiths Association of North America). In 1990 he attended the International Teaching Center for Metal Design in Aachen, Germany, where he honed his skills in the European craft tradition. He was introduced to smithing while pursuing the idea of a career as a stone and wood sculptor. He first got his hands on hot steel while taking a toolmaking class at Cabillo College in Aptos, California, and after that forged steel became his medium. At his shop on Santa Cruz's West Side, he works with hot forged iron, bronze and copper, creating unique metalwork in designs modern and historical. He has just finished two large projects; a 14' tall steel-and-glass entrance door (no pictures yet, but stay tuned), and a copper walk-through gate (you can see this one in the Gallery section under "gates." For further information on his work, to discuss a project, or set up an appointment to see more his complete portfolia and samples, you can call or fax during regular working hours at 831-427-3422. Or you can send email to: kirk@freedom-forge.com.